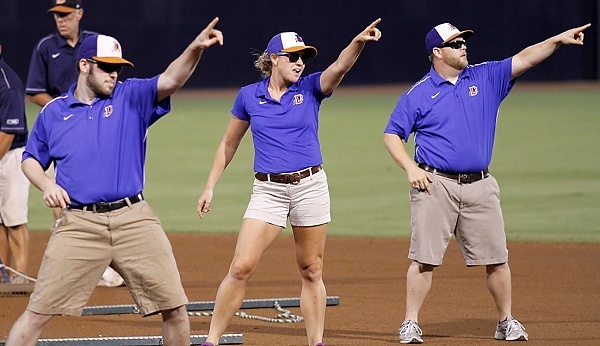 Watching Durham Bulls Baseball: Stars of the Game — The Grounds Crew! They weren't dancing last night ... they were workin! I was doing a volunteer shift at RDU and isolated from the weather, but then my shift replacement arrived shaking the water off her umbrella. A check of the webcam showed the tarp on the field. Leaving RDU I heard on the radio that the tarp’d been pulled, which meant that we were 30-45 minutes away from the game starting. I went home and watched on TV. Kudos to the fans who were still there after 9:00 pm. I did get to see a pretty interesting game played in almost continuous rain. The tarp was pulled for another delay late in the 4th inning. Then it was rolled up and the field prepped and play resumed for a while, mostly in the rain. A small fortune in Diamond Dry was spread along the baselines and around the bases, but eventually the rain won out. At the end of the 7th the tarp was pulled for the third and final time (at 10:00 this morning it's still there). Heroic efforts were made by the grounds crew and the “all hands” effort that it takes to pull and roll up the tarp, particularly the last time when the wind kept trying to get underneath it. Meanwhile the Bulls were facing their nemesis of 2010 and 2011 for the first time this year. Columbus has been one of the most talented and best-managed teams in the International League and is in the hunt for the wild card this year (Indianapolis is running away with the IL West division much like Charlotte is running away with the South). As with all out-of-division teams, the Bulls only play them four at home and four away each year. This year those games occur nearly back to back with this series and then a trip to Columbus to follow up next week. Also making the games interesting is the presence of 2011 Durham Bulls hero Russ Canzler who has been playing for the Clippers this year. Take a look at Harold Gutmann’s piece in the Herald-Sun for some solid number-crunching on the two teams and last night’s game. I’ve been lamenting the Bulls lack of power and it took new guy Brooks Conrad to change that with the key hit of the game, a two-run homer past the Bull in the 4th. Lance Pendleton had an above average outing. In fact, if he could somehow wipe the slate of a couple of unfortunate outings during the Bulls long slide in early July, his year would be looking much better. He did a great job getting out of tough situations in the 4th and, after the delay, in the 6th. Adam Liberatore got himself into, then out of trouble (bases loaded K) in the 7th for his first save of the year. Evan Longoria was activated off the disabled list and is back with the Rays. Will Rhymes will be returning. I wish Longoria well. If you keep score at the game as I do (I like the Reisner system, but the one in the programs works almost as well), you might want to consider having a very, very elegant pen to mark your scorecard. Last week, I happened to meet the fellows who make Baltz pens in Raleigh. I like stuff that’s made by hand, especially if someone can combine skill with beauty as these guys are doing. To be honest, I probably wouldn’t take the one I bought to a game. I really wouldn’t want to lose it. But it is very, very pretty and it writes well. They have a pencil under development. May want to try that when they have it done. I might take a pencil to a game. On very, very rare occasions I make a trivial mistake that needs correcting. Now with that out of the way, I have a few complaints about last night. In the continuous rain post-delay both managers were constantly talking to the crew chief (at 3rd) and to the the home plate ump. According to the broadcast only the crew chief can call/delay a game. But by the 6th inning, it was ridiculous. The grounds crew was running out bags of diamond dry every half inning while the crew chief was pointing to puddles. In the 7th when it was finally called, the ump was STILL pointing out puddles for them to mop up until the other umps basically convinced him in the first huddle of the night to call it. Now, don't get me wrong, I realize there are implications in delaying/calling games, but the crew chief treated this like it was the 7th game of the World Series. Kudos to Figeroa (I think?) who was making dirt angels in the puddle by 3rd base. In addition to that, the DBAP has reached its classic end-of-season rundown state. This seems to happen every year, and it bugs me every year. The concession stands were closing in the 3rd inning (yes I realize there was a 30 minute delayed start, but come on guys). The plumbing in the men's room was leaking. Stadium staff was pushing carts up and down the concourse. There were no programs available after the delay. And so on. The DBAP is rightly heralded as one of the best minor league parks. But come August (and especially when we host playoffs) the quality of staff and facilities really declines. Lastly, Brignac is perhaps becoming my least favorite player on this team. I realize he probably feels like he "deserves" to be in Tampa where he started the season. But the level of effort he's putting out on the field and at the plate leaves a lot to be desired. Seriously dude, when Leslie Anderson (of all people) bunt singles in front of you, don't hack wildly at the next pitch GIDP. Take a pitch or two. Good Grief! I left off the line score! Fixed. Watching on TV some of the controversy was obvious, but not all. Have to agree that it didn't make sense. Not sure what your 7-0 meant. 7 innings? At any rate, not my best effort. What puzzles me about Brignac is that he doesn't seem to change, unless I'm missing small adjustments. In the field he seems to be trying to mentor folks (perhaps to assure pitchers that he will handle ground balls) and he seems to spend a lot of time talking to Beckham when he's playing 2B. At bat, however, I almost hate to seem him get the big hit, because you know there will be a dry spell to follow. Sorry to read about the problems with the DBAP. 3rd inning! Makes no sense. Sorry, my 7-0 was building on my previous comment that my wife and I were 6-0 in games attended this season. So now 7-0. Wasn't trying to point out anything in your post.